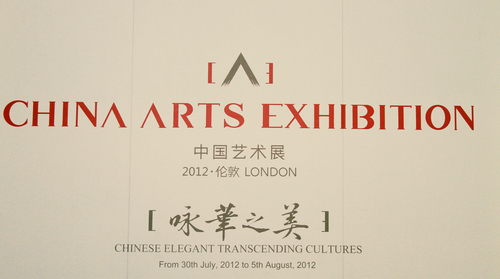 On the evening of July 30, the China Arts Exhibition London 2012 was launched at the Royal Academy of Arts. The Exhibition brought together 160 finest works of 35 most influential artists in contemporary China. Its opening ceremony was attended by people from all walks of life, including officials of the Chinese Ministry of Culture, the Chinese Embassy in the UK, the British Tourist Authority and the International Olympic Committee. Among the exhibits, the traditional Chinese paintings of Liu Dawei integrate the Chinese and Western techniques, combine the delicate and impressionist styles and present both elegant taste and popular interest; He Jiaying's simple and fine deliberate-style figure paintings present the perfect artistic patterns and symbolism in the static figures. Chen Jialing's modern Chinese paintings adopt the techniques of the ancient Chinese mural and the foreign water colour painting, creating a new school that both contains the Chinese philosophy and presents the impressionist, abstractionist and expressionist characteristics; Chen Liming's water and ink figure paintings present a simple style and the harmony between man and nature; Yang Feiyun's oil paintings shows a pure charm with the impressionist style of the traditional Chinese paintings and the Western ways of expression; and Wu Weishan's impressionist figure sculptures demonstrate the vigorous lives and souls and illustrate the unique emphasis on the inner content and spirit of the Chinese arts. He Jiaying's "Goddess of Victory", a work for the Beijing Olympics 2008, was also displayed in the Exhibition, bringing good wishes to the London Olympics 2012. In addition, the 3D water and ink painting of Nan Xi and other innovative works show the successful transformation of the traditional Chinese artistic languages and display the Chinese artists' exploration and application of the new ideas, techniques and materials. Chinese Ambassador Liu Xiaoming and Chief Executive Saumarez Smith of the Royal College of Art addressed the opening ceremony. Mr. Juan Antonio Samaranch Jr, the son of the late former International Olympic Committee president Juan Antonio Samaranch and the member of IOC Executive Board, was present for congratulations. In his speech Ambassador Liu recalled the high profile exhibition called China: the Three Emperors, 1662-1795 at the Academy six years ago. He said that Chinese President Hu Jintao and Her Majesty the Queen jointly attended the opening ceremony. That exhibition went on for 5 months and was immensely popular. That exhibition was a successful display of ancient Chinese arts. Today the China Art Exhibition London 2012 is a showcase of contemporary Chinese arts. The exhibition is first special for the selection of artists. The 160 exhibits are the works of 35 modern Chinese artists. They may belong to different age groups, but they are all highly accomplished in their fields. These fields range from traditional Chinese styles to oil painting and sculpture. Second, it is special for the distinctive features of the works. Most of the works are about people and events in contemporary China. They tell stories about what Chinese people are thinking about. They bring visitors close to what is happening in China. Third, it is special for the techniques and skills employed in artistic expression. These works reflect deep training in traditional Chinese arts. However what you see also demonstrates exciting and imaginative accomplishments in applying new concepts, new techniques and new materials. It is a superb exhibition that has built upon tradition and integrated East with West. Ambassador Liu stressed that the exhibition creates one more highlight as we mark forty years of full China-UK diplomatic relations. This exhibition also provides another wonderful contribution to the cultural celebrations of the London Olympic Games. This rich display of contemporary Chinese art offers visitors from Britain and around the world an exceptional insight into contemporary China and modern Chinese arts. This China Arts Exhibition will last for 7 days. The exhibits are all the works of the influential modern Chinese artists in the fields of Chinese painting, oil painting and sculpture. 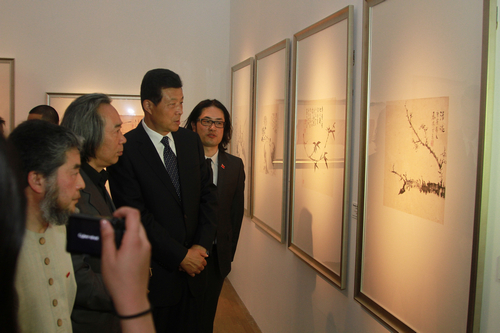 The China Arts Exhibition London 2012 is hosted by China Academy of Art and China Art Festival Foundation. After that the exhibits will also be displayed in tour exhibitions in China.